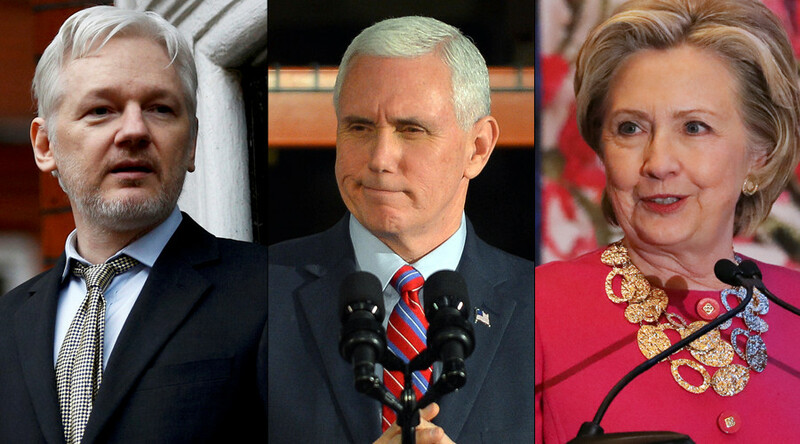 Mike Pence has branded as “absurd” Julian Assange’s claims that Hillary Clinton is pushing for a Pence takeover. The comments came after Assange tweeted that sources in the intelligence community said Clinton was pushing for a Pence presidency. Clinton stated privately this month that she is quietly pushing for a Pence takeover. She stated that Pence is predictable hence defeatable. Two IC officials close to Pence stated privately this month that they are planning on a Pence takeover. Did not state if Pence agrees. It should be noted that both the officials close to Pence and Hillary Clinton spoke of moving towards an 'impeachment' not other action. “I would dismiss that out of hand and tell you that I'm just, I'm so excited about the progress that we've been made strengthening this country, protecting this country, reviving this country's economy and all credit goes to President Donald Trump," Pence told Ingraham. Assange has seen a resurgence in the news recently after WikiLeaks published the first part of a series known as ‘Vault 7’, a leak containing details on hacking techniques developed by the CIA.